Google Analytics is a brilliant tool for every website owner to user and take advantage of. It is free and provides plentiful of meaningful statistics about your website, from your traffic sources to the average time web users are on your site, where they land onto and head next to even how many web users are on your website in real time. However, of all of the Google Analytics statistics available to view, of course, one of the most crucial is the traffic statistic. Understanding your traffic to your website is critical as it will help you understand where your website has gone right, wrong and areas for which it can improve. To better understand the traffic a website gets and how to interpret it, I will use one of my own websites , PoemAnalysis.com, as an example so we can dive into the traffic stats of it and learn the process of understanding what is going on. So the traffic of the website is definately interesting and something that is worth analysing. Of course, to someone who doesn’t know the ins and outs of the website, this can seem slightly strange why there are peaks and troths etc. – that is why it is important to know what is going on. Pretty much, if there is any change in the traffic going to the website, then it should be investigated. 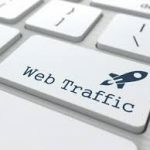 The one time this does not apply is with drops at the weekend as opposed to the week – it is very natural for websites to gain the majority of its traffic during the week and have a drop on the weekend, since people are less online and away from computers more at the weekend. The domain name changed from http://freepoemanalysis.com to https://poemanalysis.com – there was a point at which the traffic from freepoemanalysis.com did not redirect to the new website domain. The drop and then increase in traffic was due to the SEO of the new domain name being processed by Google. By 3, the SEO was back up to prior the domain name change. The traffic keeps increasing as exams for students, analysing poetry, gets closer and closer. The night before the exam there is a traffic spike as students prepare last minute revision using the website. Traffic decreases as the summer holidays start, where people generally are also away from computers. Schools are back and traffic starts to increase again. There is always a reason why traffic changes for a website so make sure you always understand why it is the case for your respective website.